So what is this about and what the heck is a giveaway hop you might be wondering. Well, let's start with what a giveaway hop is. It is a chance to link up to, in this case, over 100 other blogs besides mine check out some amazing books and enter some awesome giveaways. A big *BIG* group of us bloggers decided to get together and tell you a little bit about the books we love that we think deserve more of your attention. Books that may have flown under your radar, books that we think are pretty damned awesome, books that we think you would love if you decided to give them a try! I'm thinking your next question is: well what do I do? That's super easy and fun, check out the books I have here in my post, enter the giveaway, maybe leave me a little comment just so I can say howdy back, then click on the link for as many blogs as you want to visit. Check out their choice of books that need MORE attention, enter their giveaway, give a little hi in the comments and then head on to another blog....This is a really great way to learn about some new reads and meet some really fantastic bloggers! So I am going to tell you about two books that I think deserve MORE attention. In fact they are two books I read last year that I am still thinking about. 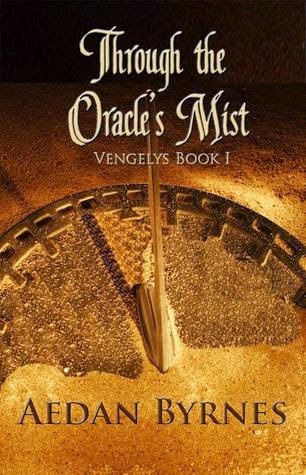 The first book I choose is Through the Oracle's Mist by Aedan Byrnes. In the blackest night, with the moon and stars to guide him, she would always be there waiting… Cyrenna thought she died the day she watched Tynan and his brothers jump through the banishment portal in an act of solidarity with Rigor. Little did she know, it would be the first of many deaths she would experience in her quest to claim his heart. She would surrender not only her immortal soul, but a mortal one repeatedly. Through a deal with the great Oracle, she has multiple mortal lifetimes to change the direction of her future and have a chance with Tynan. Her journey spans the ages from the GenPei War in Japan and the Silk Road west, to Cromwell, the Three Kingdoms and modern times, bringing her one step closer to forever until she makes a misstep. Then, the burden falls to Tynan. The only thing that is absolute is her fervent hope that he will come, but there’s one big problem. Through it all, he doesn’t so much as know her name. 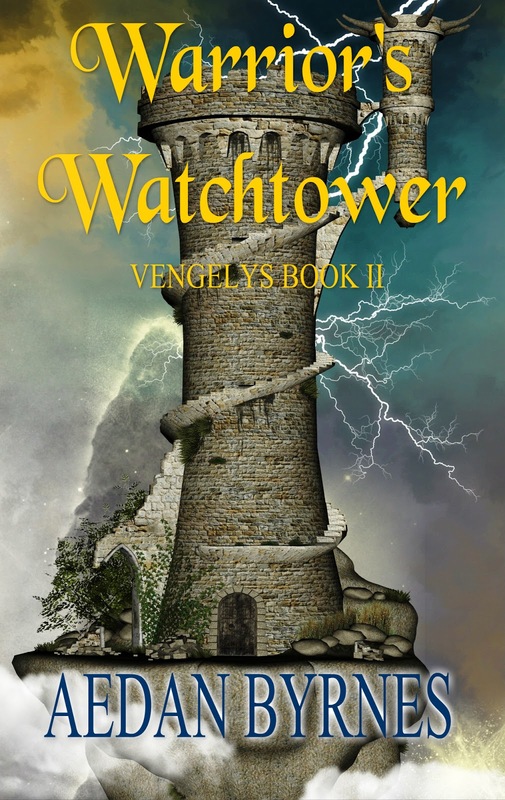 I am also really excited because along with my getting to tell you I think this is an amazing book I get to share with you an excerpt from the upcoming release of Warriors Watchtower, the second book in the Vengelys Series! So Check it out then keep scrolling and enter AWESOME giveaway, then go start clicking on all the other fantastic blogs out there and find yourselves some amazing books that deserve MORE attention! The idea that my brother had not only killed her, but had damaged her before that fateful day had me twitching with rage over and over again. Until the time came that we all remembered and laid our truths on the table, I could not explain it. That Mastema and I had an uneasy relationship to begin with only furthered the injury and rage. I did stop my fuming long enough to thank Rigor for his intercession. If Dom is going to bear the brunt of my wrath, he at least has the right to know why. I believe, knowing my brothers, that any of us would do the same and would expect the same from each other where our match-mates are concerned. It is another troubling thought altogether that has me questioning if Mastema somehow thinks Georgie is or was his. That scenario is likely to become a dual to the death between us. So Check it out then keep scrolling and enter AWESOME giveaway, then go start clicking on all the other fantastic blogs out there and find yourselves some amazing books that deserve MORE attention! Why this book? Well what if I say it is because Halloween in right around the corner and this is a ghostly tale of southern teens shut in a Civil War era mansion filming a ghost encounters story? No? How about the fact that as with all of Stephanie Lawton's books this story is more than what it appears. 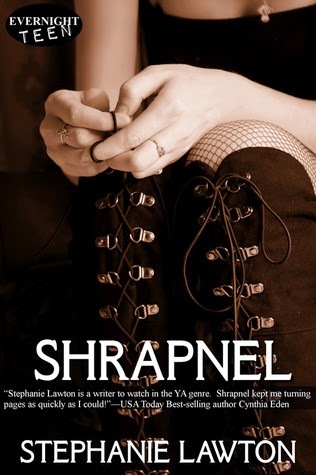 Shrapnel isn't just a YA Paranormal, it's a book that gives you chills and makes you think. She tackles difficult subjects, like bullying, and she lays it all out there just as it is and lets you take in all the feelings. 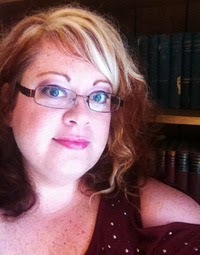 Stephanie has a grittiness to her writing that makes you dig deep into her characters as well as your own conscious. Every book of hers leaves me slowly closing the pages sitting there pondering life in general, she's not afraid to take on difficult topics and twist them around your heart. Shrapnel is told from three different points of view with each character developing in front of your eyes. Sometimes when you have that many POV's it is hard to connect with a book, but Stephanie gives a clear view into each character and their part in the story. I think this quote sums things up beautifully. I love Stephanie's way with words, they simply flow around you like musical notes. We carry secrets under our skin like shrapnel. Our surface wounds heal, but the damage festers underneath while we worry what tiny pieces will work their way to the surface for the world to see." I love Stephanie's way with words, they simply flow around you like musical notes. Thank you so much for your previous review and for choosing Oracle for this hop! I appreciate your support and am pleased you enjoy the tale so well. Thanks for sharing! Two fabulous and favorite authors of mine as well! You explained Oracle perfectly. It doesn't fit in one genre and it is Epic! I love the WW teaser! I am eagerly anticipating the release!